Freshman forward Trinity Thomas scored the opening goal in a 2-0 victory over Cornell on Saturday. 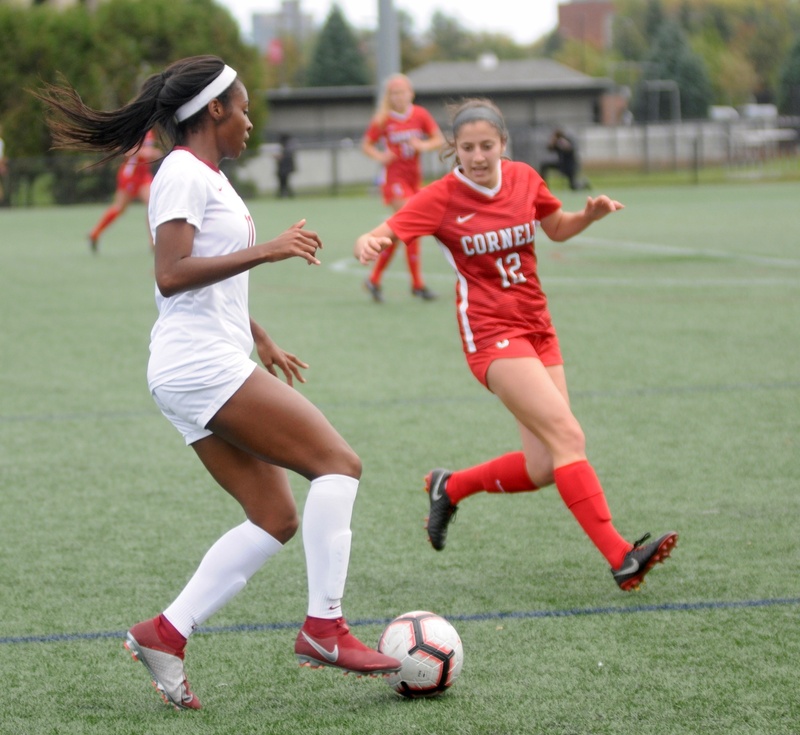 On Saturday, the Harvard women’s soccer team topped Cornell in an afternoon game at Jordan Field that featured constant offensive pressure and composed defense from the Crimson. The 2-0 tilt was Harvard’s fourth consecutive shutout and its sixth this season.The Crimson racked up eighteen shots on the day and only allowed three. With the win, Harvard (5-4-1, 2-0-1 Ivy) moved into a tie for first place in the conference while Cornell (1-8-1, 0-3-0) remains in the cellar.The Crimson has only suffered one loss at home this season, a 1-0 loss to Maine, and has won its other four matchups at Jordan Field in shutout fashion. Freshman forward Trinity Thomas netted the game-winner for Harvard with a deft volley into the back of the net in the 49th minute. The sequence began with a throw-in on the left wing that was controlled by captain midfielder Leah Mohammadi. The senior wheeled on her defender and whipped in a pinpoint cross to Thomas, who punctuated the sequence with a clean dot to the top right corner from ten yards out. The striker held off the Big Red defender on her hip and gave senior opposing keeper Meghan Kennedy no chance to make a save. 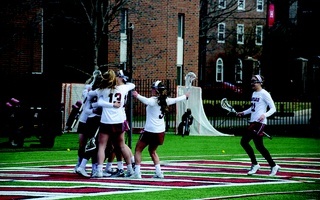 The goal was Thomas’s second on the year and her first Ivy League score. “When it happened, I didn’t really realize it happened until I saw it in the goal, and it just felt good,”the Dallas native said. Thomas is one of a number of key first-year contributors on the Crimson’s 2018-2019 squad.Seven of Harvard’s twelve goals this season have come from its impressive rookie class, and the youth movement looks poised to lead the team in the years to come. For now, though, Mohammadi is at the helm.The midfielder from Upland, Calif., paced the Crimson in both goals and shots last year, and she is off to a similarly strong start in the 2018-2019 campaign. 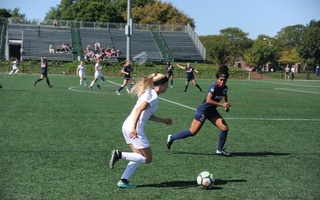 Mohammadi bagged a penalty kick in the 61st minute on Saturday to pad Harvard’s lead, and later in the second half, she nearly did it again, ripping a searing strike from distance to the top of the goal. Kennedy, who led the Ivy League in saves last year, was able to get a hand on it and push it over the bar. The goal was Mohammadi’s fifth on the year, but the highlight of the day was her assist to Thomas. “I honestly didn’t see much, but I was like, if I get the ball near the goal, maybe something great will happen,” Mohammadi said. The Crimson’s on-field chemistry is evident even from the bleachers, which has given the team a multitude of opportunities on the field. However, a recurring theme for the team this season has been an inability to finish chances near the net. The team only notched two goals against Cornell, but there were several close calls before Harvard finally broke through. Junior midfielder Meg Tveit very nearly punched one in at the end of a quick series of one-touch passes, and it took a heroic goal-line clear by a Big Red defender to prevent the goal. “In the first half, we were connecting really well, but we didn’t necessarily have that final piece,” said Mohammadi. Head coach Chris Hamblin echoed that sentiment after the game. “[We had] a lot of the ball, a lot of chances, but we didn’t create enough quality in the first half,” Hamblinsaid. On the other end of the field, Cornell managed only one shot on goal on the day, and senior goalkeeper Danielle Etzel handled it easily.The Choate-Rosemary alumna has been a veritable wall of late, and Harvard will certainly look to keep up its dominance on the defensive end. The Crimson takes on Boston University next in its last non-conference bout of the season. It will then enter a critical stretch of Ancient Eight play to close out the year, starting with a visit to Brown on October 13th. In the Harvard men’s lacrosse team’s final game of the season against rival Yale on Saturday, the Crimson stormed out to a second-quarter lead and withstood a late comeback attempt to finish off its season on a high note and without a losing record. 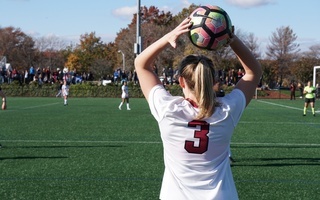 Playing in the first of three consecutive weekend away games against Ivy league opponents, the Harvard women’s soccer team found itself locked in a tight battle with Brown on Saturday afternoon in Providence, R.I.